I wanted to touch on Valentine's Day since it is rapidly approaching. Everything is about hearts, flowers and romance not to mention the chocolates in the heart shaped boxes covered in satin and lace. Although modern times depicts February 14th as a day of love. The origin of this day is much darker and has little to do with hearts and flowers. This, in my humble opinion, has become just another commercialized holiday. If you have read any of my previous blogs, you already know that I am not a fan of labels of any kind. For many who do not have a significant other in their life on Valentine's Day it can be depressing. Every card or display depicts a beautiful couple in a perfect setting which is not reality for many. What is even more depressing is if you have someone in your life that doesn't meet your expectations of what a perfect Valentine's Day should look like. Everything about Valentine's Day paints a picture of perfection and I used to strive for that perfection every year until our daughter was born on February 14th. All of sudden this day had a much deeper meaning and ceased to be Valentine's Day but became much more important. It is our child's birthday. Valentine's Day then became a thing of the past, we don't even bother to celebrate it. I just don't see why there is all that effort to show someone you love them on one particular day. You should be showing that love 365 days a year! I would much rather have my husband make me coffee every morning than give me candy and flowers once a year, Just the other day, I went into Target and saw the huge display for not only Valentine's cards but for Galentine's cards as well. Again with the commercialism. For those of you who do not know what Galentine's Day is it seems that this was a fictional holiday that was introduced on an episode of Parks and Recreation a sitcom starring Amy Poehler. I had never seen the show, so I googled it. Low and behold, it caught on and now is a "holiday". This is celebrated on February 13th and is a time to hang out with your friends. Again not sure why you need a specific day to do this but to each their own. Also if you don't have a significant other, or don't want to celebrate Galentine's Day there is always Palentine's Day. Yes, according to google, this is a holiday as well. Even as I am writing this, I am shaking my head over how complicated this has become. Celebrate the people in your life everyday you don't need someone telling you when to do it! Would love to hear your thoughts and ideas on the subject. Don't get hung up on tradition, there is always room for improvement and whether you are celebrating one of these holidays or not or just want to make something special scroll down for a fabulously easy chocolate mousse recipe. 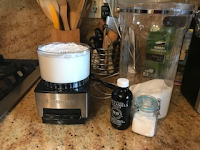 For this week's recipes I recycled one of the ingredients, I hate waste and found a great use for something that I would have typically discarded in the past. 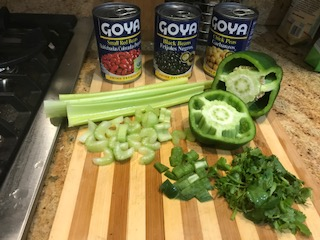 For my first recipe I wanted to do something quick and easy for lunch so I did a bean salad. 1/4 of balsamic vinegar (I used golden balsamic but any one will do) then just add salt and pepper to taste. Simple and easy! Typically when I made this type of salad in the past, I would drain all the beans, give them a quick rinse and discard the liquids from the can. I had been reading about aquafaba which is the liquid chickpeas comes in and saved it in an airtight container. 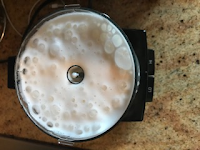 You can also make aquafaba yourself using the water from dried chickpeas. I never realized what a wonderful, versatile ingredient that I was throwing away. 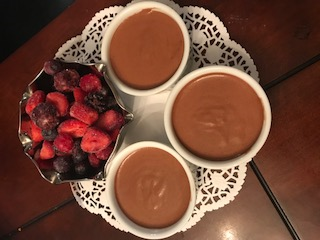 So for those that are celebrating Valentine's, Galentine's, Palentine's Day or just nothing at all, I have the perfect dessert! 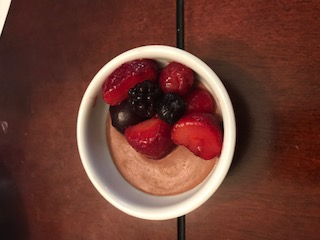 This is the finished product, it was absolutely delicious topped with frozen berries. This recipe yielded 4 servings. 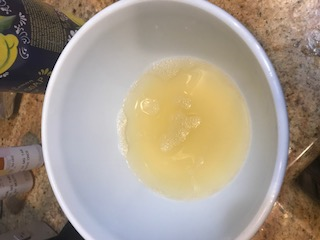 The bottom picture is what the aquafaba looked like right out of the can, it resembled egg whites. After blending it in a mini food processor the texture became meringue like and formed smooth peaks. 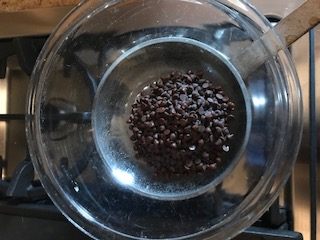 I melted 1 cup vegan chocolate chips in a bowl over simmering water. 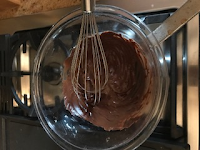 I added 1 tablespoon of sugar and 1/4 teaspoon of salt to the meringue mixture. 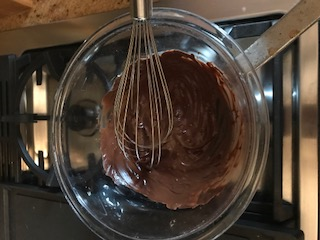 After chocolate cooled slightly I folded it into the aquafaba using a whisk to mix thoroughly. I had vanilla on hand to thin the chocolate if it got too thick but I didn't need it. It came out perfect. As always I hope you enjoyed this week's post and I look forward to sharing Bella's story next week. Bella is our newest addition to the family. Please remember you can help a lost pet get reunited with their family or help a shelter pet find a home by sharing any posts on your news feed. It is quick, easy and really can make a difference for that one animal. Check out The Smoothie Vegetarians on Facebook. Please Like, comment and share my post if you enjoyed it. Don't forget if you experience something new, something good happens or you are just having a good day add it to your gratitude jar. Celebrate the little things in life every day.